How Much Weight Can You Lose in One Month If You Go to the Gym Every Day? Exercise is a critical part of living a healthy lifestyle. When it comes to weight loss, daily exercise produces significant results. While exercising is a healthy choice, it's important to be sure you're not overtraining your body. Be sure you get at least six, preferably eight, hours of sleep each night to promote muscle recovery. Always consult a health care professional before starting a new workout regimen. The Centers for Disease Control and Prevention, or CDC, recommends exercising for 30 to 60 minutes daily. You can burn a significant amount of fat by exercising at a moderate pace for a maximum of 60 minutes, or by exercising at a more vigorous pace for 30 minutes. Exceeding 60 minutes per workout, especially when exercising every day, can lead to overtraining. Performing shorter, vigorous-pace workouts on back-to-back days also raises overtraining risk because it can put excess strain on your muscles. Overtraining raises risk for muscle and bone injuries. These include muscle atrophy, which is the loss of muscle. Weight loss occurs when you create a calorie deficit, which simply means you're taking in fewer calories than you're using. To burn 1 lb. body fat you must create a calorie deficit of 3,500 calories. While the majority of that calorie deficit can be achieved by modifying your diet, exercise helps fill in the gaps. The CDC recommends losing weight at a safe rate of 1 to 2 lbs. per week. That means you can safely lose up to 8 lbs. over the course of a month by working out each day. According to the Mayo Clinic, a 200-lb. person can burn 728 calories per hour jogging at a moderate pace of 5 mph. 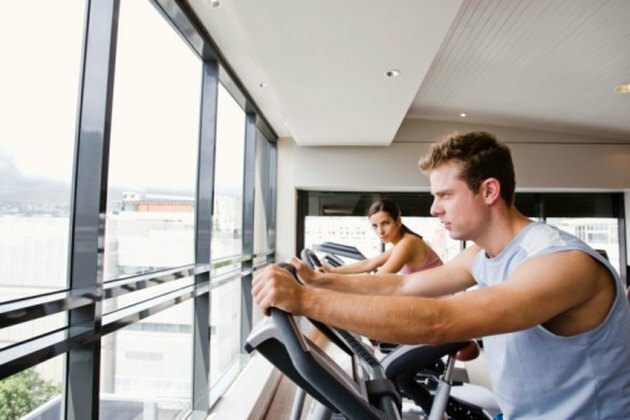 The same person burns even more calories on a stair climbing machine -- up to 819 calories per hour. Walking on the treadmill is also an effective aerobic workout. A 200-lb. person burns about 346 calories per hour walking at a brisk pace of 3.5 mph. Performing 60 minutes of resistance training using free weights or other weightlifting equipment could help a 200-lb. person burn 273 calories.